We do get some new details today, however, with a video introducing the automatons. These massive machines are able to handle harsh labor all day in a way that humans can’t, only stopping occasionally to refuel. It all sounds good until senior lead designer Jakub Stokalski asks “How will your people react to them? Are they really safe to use inside the confines of the city? These are the questions that you’ll have to answer for yourself.” If you have to ask whether or not the giant robots are coming to kill everyone, you probably already know the answer. 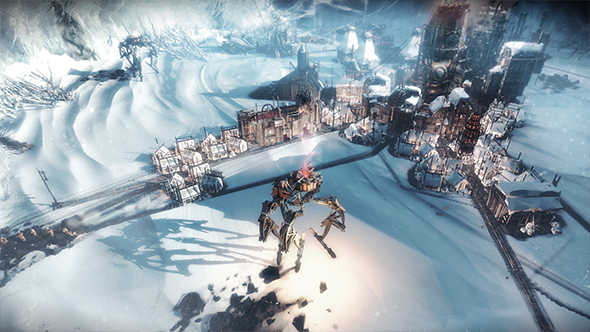 Frostpunk is set to be available across Steam, GOG, Humble, and “other digital stores for Windows.” No word on pre-orders or final price just yet, but the developers do indicate the price will be somewhere between that of a small indie title and a AAA release. Our time with the game has been great – just don’t forget to turn the heater on.